We all enjoy street dance, right? The authenticity, originalism, acrobatics, improvisation, and creativity are always unexpectedly impressive. Check out this cool video about Universal Alchémy Dancers. Meet the street dancers Chem, Fantum, Frankie, Ken fury, Napalm, Omen. A Visual Story of the Foliage in & around New York City. Watch the short film about a cookie-obsessed pig that has film festival audiences laughing and cheering And a list of the best cookies in NY. It's finally here. After taking nearly a century to build, the 2nd Avenue subway extension in Manhattan opened at 72nd, 86th, and 96th Streets. INFLUENCERS is a short documentary that explores what it means to be an influencer and how trends and creativity become contagious today in music, fashion, and entertainment. This VIDEO was made from a collection of 4,000 street portraits gathered in New York City for the Humans of New York project (a.k.a. HONY). This video presents interesting sound and image effects, a mosaic of creativity and lights, sounds and movements. 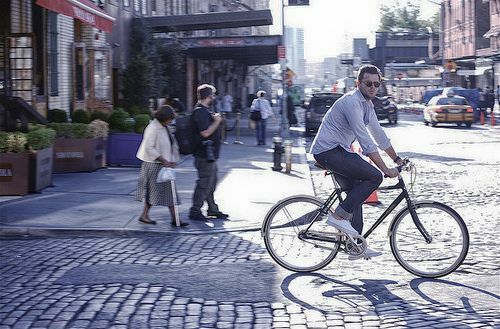 How to explore New York City riding a bike. A nice collection of images from beautiful footage of autumn in New York City. Wanna talk like a New Yorker? Then you gotta know the lingo. Fall in love in the New York City subway. Winter is coming. Are you a big fan of whiskey? Then you will enjoy this short film about New York Distilling Co. breaking down the process of producing good spirit. Cheers! Do you like cats? So you're going to love this story. A two-day trip into the History of the U.S.